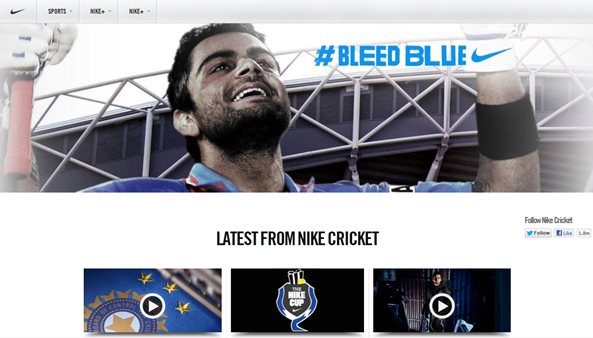 POWERING BRANDS: Campaign Watch: Nike Cricket’s new Bleed Blue commercial Earns its Blue! Campaign Watch: Nike Cricket’s new Bleed Blue commercial Earns its Blue! T20 World Cup is just around the corner and brand promotions involving cricketers are gaining momentum. Nike is back with a new Bleed Blue commercial that talks about how training and hard work are the only way you ‘Earn your Blue’. The video features rising stars of Indian Cricket led by Virat Kohli. The well-written and well-made new video has been uploaded on Nike India’s Youtube Channel and is being pushed via video banners across web publishers. Excellent wall posts on Nike Cricket’s Facebook brand page share #bleedblue branded images from the shoot in addition to the commercial. Copy on the posts is minimal, sticks to the theme and is a study in how to write less and still manage to drive the point. Budding social media content writers please take note. The posts are replicated on Nike Cricket's Twitter Handle.